39 min 16 sec ago. 56 min 45 sec ago. 3 hours 8 sec ago. 22 hours 48 min ago. In 1985, as a youthful, ingenuous reporter for the Las Vegas Review-Journal, I sat next to the general manager at a Lake Tahoe awards banquet and asked him about the Las Vegas Sun. “When will the Sun go out of business?” I wondered of the competition, which I had, in my competitive zeal, come to think of as the Evil Empire. “Because if we let the Sun die, a large newspaper organization might come into town and really compete with us,” Johnson said matter-of-factly, mentioning the L.A. Times and Gannett, if memory serves. 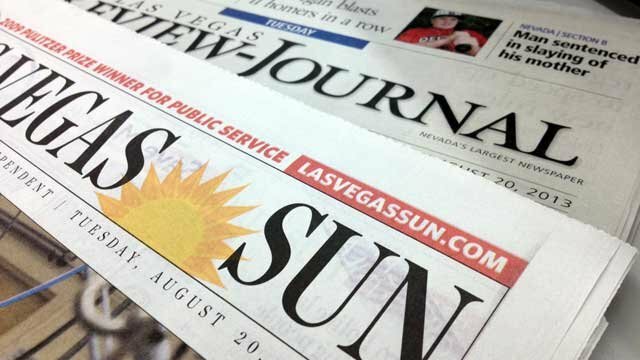 Sure enough, four years later, with Sun patriarch Hank Greenspun on his deathbed, and wanting his legacy preserved, the RJ and the Sun negotiated a Joint Operating Agreement that would preserve the failing, smaller newspaper. It was a ruthless business move by the RJ and a necessary one for the Greenspun clan. I couldn’t help but think of that conversation when I heard about Hank’s oldest son, Brian Greenspun, suing the RJ’s parent company, Stephens Media, to prevent the dreaded rival from making a deal with his siblings to dissolve the JOA. The first round of the legal battle – and probably not the last – concluded Friday morning when federal Judge Jim Mahan refused to grant Brian Greenspun’s wish that his siblings not be allowed to make the deal with Stephens. I feel like another bookend is about to be placed on the shelf in the history of journalism here for the last quarter-century, with my own odyssey that took me into both newsrooms giving me a birds-eye view of how they operate and my sources giving me insight into what has occurred. I began at the RJ, spent 13 years at the Sun and now look back not in anger but also not happily at what has happened and likely will happen. This is a much-misunderstood story, portrayed mostly as a Sun vs. RJ war, when really it is a tale of fraying family bonds, two declining news organizations and the inevitable end of what once was. I don’t know if the Sun is going away – the print edition may as well not exist because it is old, old news already published online days ago. But it will never be the same, and has not been the same for some time, nor has the RJ, as staff gutting and management shifts have dramatically changed the quality. When I first came here in 1984, I marveled at the raw material that existed for a truly great newspaper to evolve in Southern Nevada, a fascinating boomtown that behaved like a small town and where the potential for aggressive, meaningful journalism was limitless. But nearly 30 years later, and having worked for both organizations, I am not sure how I feel about what is happening. Indeed, my feelings for both newspapers are complicated. The RJ brought me to the state in 1984 – thank you, Charlie Zobell, a good man who was the city editor. But it slowly has declined until the nadir of the Sherm Frederick/Tom Mitchell travesty of 2010, when the publisher/editor combination collaborated to transform the newspaper into an in-kind contribution to the campaign to defeat Senate Majority Leader Harry Reid. And now, under new management, the paper has fired many good people and seems absolutely clueless about the web – it may have the worst big-city web site in the world. As for the Sun – the parent company hired me in 2000 to write a column, oversee a newsletter and host a TV show – it has gone from a scrappy competitor to the RJ that attracted great editors and reporters and won a Pulitzer to a “Sunsert” in the RJ and a website where you have to cover your kids’ eyes lest they see the prominent silicone highlights. There is still some wonderful journalism there, and I loved what I did there until last year – thank you, Greenspuns. But after being hypnotized by a variety of Internet fast-talkers, Brian Greenspun, who barely knew the web existed when I went to work there, has allowed the Sun to mutate from a Pulitzer-worthy newspaper to click-happy embarrassment. Yes, I would love to live in a city with two vibrant, competing newspapers. But that has not existed here for a long, long time, nor has there been a real commitment to excellence. The newspapers have not grown in sophistication as the population has exploded. They have remained what the city mostly is: Insular, small-minded, incestuous. This is not meant to deride the reportorial staffs. Some of the journalists are impressive and will go on to glory elsewhere. But there is no culture of creativity or dedication to greatness at the top. I feel as I do when I hear state lawmakers pining to get to the national average in education funding: Can’t we aim a little higher than mediocrity? The RJ, which had so much potential when I arrived in 1984, has slowly gone downhill. Its lack of foresight when the web arrived as a real outlet for information was part of what prompted me to go to Greenspunland after I realized one empire is no more evil than another. My parting with the RJ was mostly amicable, although Mitchell classily sent me an email saying I would last only six months at the Sun, then sent an interoffice note implying I was a whore. Frederick, to his credit, was classy and wished me well – he had graciously allowed me to continue to write a column after I began publishing a political newsletter in 1993. I never looked back at the decision to work at the Sun, which I agonized over for weeks. It was the best career move I have made. And there were great things happening there as the millennium turned. Danny Greenspun especially understood the world of multiple platforms, and I now had three. 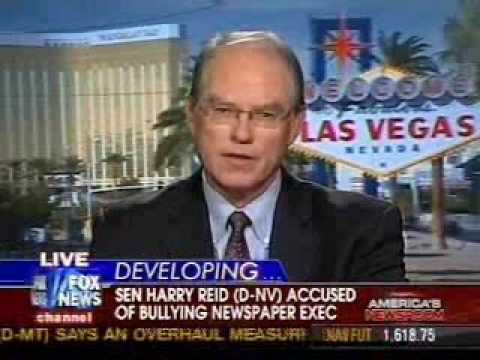 The RJ’s decline was most evident in 2010 when its political coverage and editorials showed a clear bias to evict Harry Reid from DC. The editor and publisher wrote blogs and editorials eviscerating him every chance they could. Shortly after Reid won, they were dispatched by the home office – if you shoot at the king, gentlemen, you better kill him. The paper still hasn’t figured out the web, and the defrocked Frederick remains a columnist and blogger on the RJ site, obsessing over Reid and President Obama in some of the most unoriginal and vitriolic offal on the planet. The staff is thin, the ethics thinner, the future dark. Meanwhile, the Sun won a Pulitzer in 2009 for brilliant, dogged reports by Alexandra Berzon about injuries on the Strip. A combination of a young, aggressive reporter with fine editorial oversight produced that magical achievement, almost duplicated a couple of years later with a marvelous probe of hospitals by Marshall Allen that was a Pulitzer finalist. Both of those reporters have moved on – Berzon to the WSJ and Allen to Pro Publica. Superb reporting still occurs, especially on the political beat, where Anjeanette Damon and Andew Doughman run circles around the RJ, which I now simply call the “newspaper” because it is hardly recognizable to me, despite the presence of some fine reporters. As the other Greenspun siblings began to lose interest in the Sun and Brian took more of a hands-on approach, the product began to suffer. Captivated by whispers from web consultants, he greenlighted a disastrous web TV show hyped by a supposed wunderkind named Rob Curley, alternatively referred to by critics as “Internet Jesus” and “Harold Hill” of Music Man fame. Curley eventually left, leaving another putative web guru, Bob Cauthorn, to whisper great ideas in Brian Greenspun's ear. Cauthorn once told me a brilliant idea for synergy with my TV program and the Sun site: Have a commenter on my column guest-host once a week. I kid you not. So the Sun has devolved into a site where excellent stories are obscured by the entertainment reporting and celebrity photos. Reporters obviously are being urged to write stories that have multiple click functions to artificially inflate hits on the site. And the paper is losing a fortune every year. After the Greenspun matriarch, Barbara, died two years ago, the already fractured family began to disintegrate into warring camps. This came during a time in which the Greenspun empire, with gaming and real estate holdings, too, was devastated by the recession. 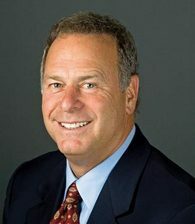 Brian Greenspun’s younger siblings hold him largely responsible for costing the family hundreds of millions of dollars. Blood generally is thicker than money. But when you start getting close to 10 figures, it starts to thin a little. I departed from the Sun about a year ago as several factors coalesced. Brian Greenspun took my producer, Dana Gentry, off a story about the financial dealings of Jeff Guinn, the former governor's son, that she had broken and pursued in the face of a frivolous, insidious legal maneuver that was designed to intimidate the news organization and chill Gentry's reporting. Suddenly, after years of coverage by Gentry, Brian Greenspun decided she had a conflict because of a smear campaign in the courts, just the result Jeff Guinn wanted. By coincidence, Brian Greenspun's lawyer was then Jeff Guinn's lawyer. Soon thereafter, Greenspun, eager to dump my salary, began discussing jettisoning me with the higher-ups at KSNV, the station that airs "Ralston Reports" in Las Vegas. As that happened a year ago, for the first time in more than a decade, he killed one of my columns, which was critical of his friend Harry Reid for raising the specter of Mitt Romney not paying taxes. I refused to ever write a column for the paper again, and a few weeks later, after some messy negotiations, I was gone. I left more wistful than sad, thankful for the nearly 13 years I was there and how Brian Greenspun generally left me alone and supported my journalism. But as I went out on my own and started this site, I couldn’t help but think that the financial issues and the sibling rivalries would soon reach critical mass. The family brought in Paul Hamilton, a financial expert, to assess the Sun’s value and determine what to do with the losing proposition – it has, I’m told, hemorrhaged tens of millions of dollars since Brian Greenspun took a more hands-on approach and let his Internet geniuses cook up losing schemes. It’s hardly a newspaper anymore, which is sad. Great stories by excellent reporters sit next to silly fluff – entertainment and sports are highlighted while hard news seems secondary. So it’s no surprise that the three siblings were receptive earlier this year to an offer to dissolve the JOA, which they agreed to in principle and are still negotiating. (Ironically, my lawyer, Don Campbell, is representing the RJ.) When Brian Greenspun saw what was happening, he tried to stop his family members by suing the RJ and portraying this as a case of the big bad Arkansas-based newspaper company wanting to squelch the Sun’s community-minded, homegrown voice. But what we are really talking about here is Brian Greenspun’s voice, which he wants to use to maintain influence but wants, ironically, the hated RJ to subsidize. He would buy the Sun but on terms his siblings won’t accept. THE END IS NEAR -- BUT OF WHAT? So here we are, and now you know how we got here. Where to now? Both organizations have fallen so far that I can’t feel sympathy for either one. The RJ sees an opportunity to shed a burdensome financial obligation while Brian Greenspun craves continued relevance through the newspaper. This is not keeping a great newspaper war going – that expired long ago. And without a commitment to quality journalism – and neither outlet has that at the top – I am torn whether to feel a sense of schadenfreude or sadness. If the Sun dies – and it’s possible it could survive in some form on the web – I ache for the journalists and others who will lose their jobs. Many good ones already have at both papers during the recession, and perhaps some would be absorbed into the RJ. But no one should be misled into thinking that the RJ will suddenly develop a thirst to become the great newspaper of the Southwest if the Sun vanishes. This is about money. Nor should anyone think Brian Greenspun wants to make the Sun into a first-rate newspaper. In one court document, he didn’t even know what his own paper had done to win a Pulitzer. The world is a different place now than when I asked Earl Johnson that question 28 years ago. The RJ does not fear another newspaper coming in to compete; its monopoly would be secure. If Brian Greenspun wants to keep the Sun alive, he should call Warren Buffett, who is buying NV Energy, or someone else. Maybe Jeff Bezos wants a West Coast presence. Or Greenspun should put in his own money. This also has nothing to do with antitrust questions or preserving newspapers. This is the inevitable consequence of poor management, a terrible economy and a family unraveling. And it is disheartening. After seeing these two companies I worked for slowly be degraded, I’m not sure it matters much what ultimately happens -- neither one is much of a newspaper anymore, really. The saddest thing I can say about all of it, with my conflicting feelings toward places I once loved, is that I really don’t care all that much who wins.